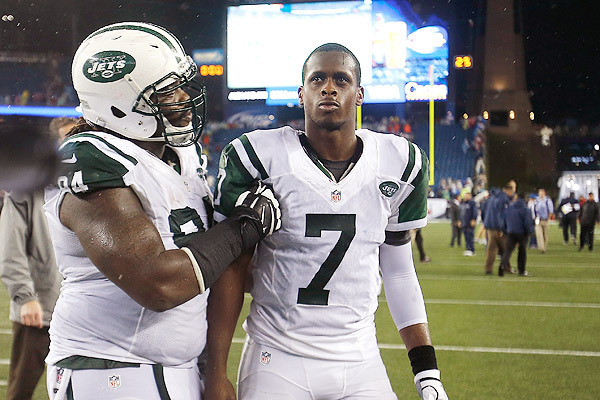 New York Sports Plus: Are the Jets Primed for a Playoff Spot? I knew that the defense would be good, but not this good. They have the best defensive line in the NFL, led by all-around threat Muhammad Wilkerson. Last year he proved to be a great run stuffer, but he's getting better at pass rushing too. Rookie Sheldon Richardson is basically the same player as Wilkerson, but not as good at the moment. While he's a better pass rusher than Wilkerson, the run defense is just below ole Mo. He'll get there eventually. The real key has been Damon Harrison. His nickname, "Snacks," is among the best in sports, and boy is it fitting because he is a large man. He's also among the best defensive tackles in the league. When he isn't snacking on running backs, he eats up space, freeing up the rest of the defensive line to roam. This has led to the Jets allowing the fewest rushing yards per game (73.8) in the NFL. While the pass defense is in the bottom half of the league, overall, the Jets have allowed the seventh fewest yards per game so far, at 325.2. The secondary is still bad, but they are so good up front that the effect isn't as bad. The Jets are seventh in the league in sacks with 27 so far this season, meaning that against both aspects of opposing offenses, they are winning the battle of the trenches. As we've seen with the San Francisco 49ers and Seattle Seahawks recently, dominating, physical play up front translates to wins. Obviously the Jets isn't as good as either of them all around, but the same idea applies. The offense could be one of the most confusing units in the NFL. Anyone with eyes can see that there isn't much talent, especially when you look at the receivers. And yet, every other week, Geno Smith seems to be really good. He is able to make impressive throws and decisions, and while he still shows that he's a rookie, he shows a lot of signs of promise. Then, in even numbered weeks, he looks like a 2012 Mark Sanchez clone. Then, for no reason, last week Chris Ivory looked amazing, while in Week 3, the same thing happened to Bilal Powell. Other than that, they've been pretty average, which should be cause for concern, but their ineffectiveness hasn't really cost the Jets anything. It's as if either of them showing up is just an added bonus, which, looking at this roster, makes absolutely no sense. The two running backs are the only chance the Jets of having any sort of an offensive threat that opposing teams will care about. As for Geno Smith, he will continue on that up and down pattern for the rest of the year, and there's nothing much that the team can do about it between now and next season. He's a rookie who has to rely on Stone Hands Hill and Greg Salas, so he's going to show flashes, then come right back and crush your dreams either on the next play or in the next game. So what does this mean for the postseason? Well, their defense puts them in a very good position to sneak in. Right now, they are the number 6 seed in the AFC, and would travel to Indianapolis to face the Colts. The way the AFC is set up, the only Wild Card slot available in the 6 seed. The Chiefs or Broncos will grab the 5 seed and probably end up with the best record of any Wild Card team in NFL history. The other one of those teams will probably get home field advantage throughout the playoffs as the 1 seed. Then, the Bengals, Patriots, and Colts are comfortably ahead in their respective divisions. The Browns or Jets could sneak up on the Bengals or Patriots respectively, but I highly doubt either team is winning the division. Sitting at 5-4, their closest competitors are the 4-4 Chargers, 4-4 Titans, 4-4 Dolphins, 4-5 Browns, and 3-5 Ravens. Personally, I'm going to count out the Dolphins because they have a relatively tough schedule coming up. After playing the lowly Buccaneers, I counted five games against teams that are at least decent (San Diego, Carolina, New England, and the Jets twice). And because I'm eliminating the Dolphins, I should also say goodbye to the Browns, as Miami holds a tiebreaker over them because of their Week 1 victory in Cleveland. If Brian Hoyer were still around, I wouldn't count them out, and while Jason Campbell has been decent, their running game is abysmal, and their quarterback can't make up for that despite having two of the best weapons at their respective positions in Josh Gordon and Jordan Cameron (Fantasy Team Alert). Two down, four remaining for that final playoff spot. The Ravens are finished if they lose this week at home to the Bengals. Their offense has been worse than the Jets so far, (who woulda thunk it?) because Ray Rice looks very washed up, and after Torrey Smith, their best receivers are Jacoby Jones and Tandon Doss. I don't think that they'll make it to the playoffs, even if they win on Sunday. Three teams standing, and the Titans are currently in the best position. They have beaten both the Chargers and the Jets, so the tiebreakers are squarely in their favor. They also have the luxury of playing the Jaguars twice, which guarantees them two wins. I also believe that they can and will beat the Texans at home. They can win either hosting the Cardinals or in Oakland, and can squeak out a victory at home for the Colts. That puts them at 8-8, and winning both games will make it really interesting. The Chargers have four games against the Chiefs and Broncos, and a game against the Bengals. That's going to be pretty brutal, but they also get gifts in the form of the Raiders and Giants at home. Throwing Miami into the other five games that I mentioned, they need to get 3 wins to get to 9-7, which I don't see happening. And now, we have the Jets. Then only good team left on their schedule is the Panthers, but for some reason the schedule still scares me. The Dolphins twice, the Ravens on the road, and home games against the Raiders and Browns should be easy, but not for this inconsistent team. Giving them a win at Buffalo next week, they would need to win 2 of the above games to reach 8-8, but that Titans tiebreaker will come into play. I have all but eliminated the Chargers, so it is between the Jets and Titans in my mind. If the Jets are able to show any semblance of consistency down the stretch they could clinch a berth in what should be an excitingly close race. Call me crazy, but I say that happens. The Jets will make the postseason (and proceed to get killed on the road, but that's beside the point). Though that loss to the Titans may just be the most important tiebreaker in the NFL this year.